The “feedback sandwich” is such an incredibly dishonest approach to giving feedback, quite apart from the emotions that it generates int eh receiver. I have seen people get really cynical about their manager, and receiving feedback and develop all the defence mechanisms as a response. Thank you Colin. It’s sad because worthwhile compliments lose their impact because of the feedback sandwich. Thanks for adding your insights. Look for those producing work and satisfying the customer, even if the customer is an internal one. Know your people’s work well enough to select aspects of the work that are praiseworthy. Avoid false praise. Today’s worker is so skeptical he/she sees right through hyperbole. Thanks Jim. We can’t over-estimate the importance of being genuine when giving praise. It feels degrading to be manipulated. Glad you joined in. One reason managers use the sandwich method so much is because few companies have given them the coaching or training to know how to deliver “negative” feedback. In that case, managers need to educate themselves by reading a book, go to a workshop or hire their own coach. In the military, they make their negative remarks first and then praise after, it’s different but once you get accustomed to this method, you appreciate the honesty that is given because it makes you a better performer. Praise is extremely important but honesty is also equally important. If your personnel can’t take constructive criticism, then I question their desire to become better. 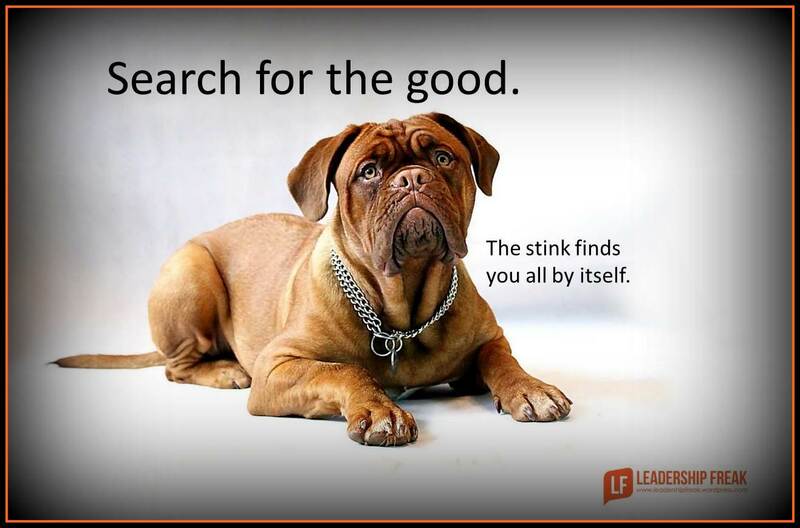 Search for good is conscious effort. It does not happen automatically. We need to find good even from the bad. In other words, we should appreciate and encourage good behavior irrespective of person. There may be many infamous people but when we like some part of their behavior, they deserve recognition. This helps them to improve. It is equally true that many times, we do not complete our sentences. It keeps other unclear about our intention. It is important to say complete words. It shows our integrity. I appreciate your point, that we should avoid energy waster. There are people who deliberately engage and divert your intention. One should be careful about such characters. One way to aggressively search for good is to devise reward system. Such mechanism should take into account intangible part like effort, behavior, ethical consideration, encouragement etc. These components are generally missing in reward mechanism. This can make any ordinary organisation into outperforming or extraordinary. A concise and useful article that brings some focus to how to best find ‘best practice’ as well as the need to stray away from only giving praise as part of ‘the sandwich’… Something that managers do too often. Where we focus is where our energy goes to. If a manager looks for reason to acknowledge appreciate and inspire they will find it and colleagues will do so too. When a ” stretch” is then given in this climate it is more real because good is looked for also. I used to keep 10 pennies in my pocket and would transfer them one at a time every time I noticed something worthy of genuine praise, my aim was to have transferred them all by the end of the shift; this was a useful reminder to look for the positives and not only the areas that could be improved. Positives attract positives and Leadership matters. wow! as a sales manager, i have corrections to make after this. thanks a lot!